MOSS LANDING—Wart-like bumps of stinging cells cover the feeding arms and bell of a newly described deep-sea jelly, published by MBARI biologists in this month’s issue of the Journal of the Marine Biological Association of the United Kingdom. This softball-sized, translucent jelly moves through the water like a shooting star, trailing four fleshy oral arms—but no tentacles—behind it. 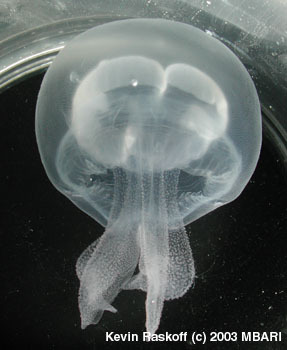 This and other unique features resulted in the jelly’s categorization as a new genus and species. 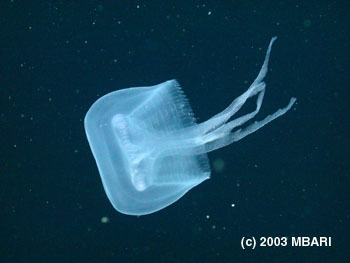 The MBARI researchers named the jelly Stellamedusa ventana. Its genus, Stellamedusa, refers to the jelly’s translucent blue-white color and trailing arms, which reminded the scientists of a slow-moving meteor or shooting star. It’s species name, ventana, refers to MBARI’s remotely operated vehicle (ROV) Ventana, a deep-diving submarine robot that first recorded the jelly on video in 1990. Before they created an official name for this animal, researchers gave this jelly the nickname “bumpy” because it’s bell and oral arms are covered with small bumps, which are actually clusters of stinging cells that the jelly uses to capture prey. 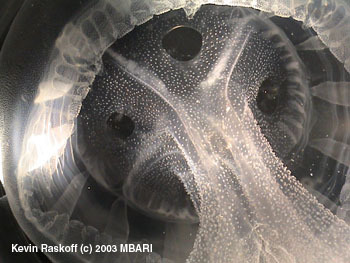 Kevin Raskoff, primary author of the paper, says of the new jelly “Although it’s highly unusual for a jelly not to have tentacles, several deep-sea species have evolved this way. They have also evolved unusual feeding strategies, which rely on other parts of their body, such as the bell and oral arms, to capture prey.” Formerly a postdoctoral researcher at MBARI, Raskoff now teaches at California State University, Monterey Bay. Here is some of what they do know: S. ventana has been observed at depths between 150 and 550 meters (about 500 to 1800 feet), just below the level that sunlight can penetrate, but above a layer of very low oxygen levels. This region is known as the mesopelagic realm, and is the home of entire communities of gelatinous animals. In fact, based on field and lab observations, the researchers believe that this jelly may feed primarily on other jellies. To study the jelly’s eating habits, the researchers placed a captured jelly in a tank with small shrimp and pieces of squid. The shrimp and squid collided with batteries of stinging cells on the jelly’s bell and stuck there. The prey then moved slowly down to the edge of the bell. At that point, the jelly transferred the prey to one of its oral arms, where it slowly moved up the arm and into the mouth. K. A. Raskoff and G. I. Matsumoto, Stellamedusa ventana, a new mesopelagic scyphomedusae from the eastern Pacific representing a new subfamily, the Stellamedusinae. 2004. Journal of the Marine Biological Association of the United Kingdom. 84, 4274/1-6. Note: These images may not be copied, reprinted, or used without explicit permission from MBARI. Members of the media needing higher-resolution versions should send an email to pressroom@mbari.org. Stellamedusa ventana has been observed off the coast of California and in the Gulf of California, but the full extent of its range remains unknown. 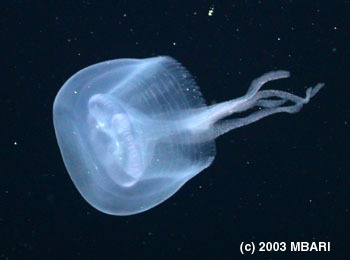 In over thirteen years of deep-ocean diving, MBARI scientists have only seen this jelly seven times. Using a remotely operated vehicle, MBARI researchers captured this Stellamedusa ventana and brought it into the laboratory to study its eating habits. The bumps on Stellamedusa ventana’s bell and arms are loaded with stinging cells (nematocysts) that can capture and hold on to prey up to 5 cm (2 inches) across. 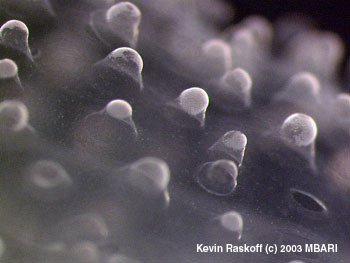 In this close-up image, the nematocysts give the tip of each bump a frosted appearance. Apr 10, 2017 - In the first quantitative analysis of deep-sea bioluminescence, MBARI researchers Séverine Martini and Steve Haddock show that three quarters of the animals in Monterey Bay from the surface down to 4,000 meters deep can produce their own light.